The PTR-2PS pulse transceiving relay is a specialized pulse isolation and repeating relay system designed to receive pulses over long distances (up to approximately 2 miles) and protect customer equipment. It utilizes a 2-wire current loop to source a nominal +12VDC wetting voltage to the electric meter’s dry contact output. 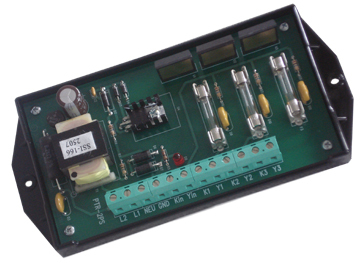 It receives the switched voltage back to activate the PTR-2PS’ output relays. 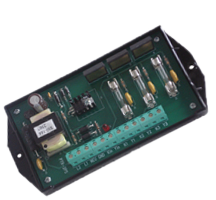 The PTR-2PS is available in 1, 2, and 3 Form A outputs (K & Y). Its current loop design will adjust the output voltage to overcome and compensate for the resistance of the wire loop. The PTR-2PS is intended to be located at the location of the receiving equipment – usually a customer-owned energy management system. It acts primarily to protect the customer equipment from large transients that could be coupled into long wire runs between it and the electric meter. Transients which are coupled into the wire loop between the originating pulse output and the receiving relay are contained within the loop and suppressed by means of heavy duty transient suppression devices. Each time the pulse output closes, the current loop sends sufficient current though the wire loop so as to receive back the required current to activate the relay outputs. If the resistance of the wire loop is high, the PTR-2PS will automatically raise the wetting voltage until the optimum current is received back. In this manner, wire length and size in the current loop are not critical. Longer distances may be obtained with larger gauge wire. The PTR-2PS has a built-in low voltage transformer-isolated power supply and may be used with meters having high or low voltage semiconductor outputs, or mechanical output contacts (relays). Typical applications include interfaces between utility metering devices and customer-owned energy control systems. A bright red LED lamp indicates the system’s status at all times, thus allowing a rapid check of the system’s performance without requiring any additional test equipment. The PTR-2PS’s input and output circuit’s terminal strip is a “EURO” type connector. When the stripped wire has been correctly installed in the terminal “slot” there are no conductive parts exposed on the surface of the terminal strip. Due to the inherent current-limited nature of the design, no fusing is necessary on the input. No damage will result if the current loop is shorted to itself or to ground. The PTR-2PS has built-in MOV transient protection for the three solid-state relay outputs as well as for the current loop, eliminating the need for external surge suppression. In addition, each of the three solid-state outputs have fusing with standard 3AG or AGC fuses. All component parts that have power applied to them, with the exception of the input/output terminal strip, are enclosed in a polycarbonate cover for maximum protection. The mounting base plate is also made of polycarbonate and offers excellent electrical insulation between the circuit and the mounting surface. The PTR-2PS is designed to mount in a suitable electrical enclosure for the application. Input Voltages: 125 VDC input using the DCS-1 Power Supply. 15-48VDC input using the DCS-2 Power Supply.Contact factory for other input voltages.